And she wasn’t the only person bewildered by the turn of events. “It was so confusing,” said HtTYD2 director Dean DeBlois. “I thought someone was coming to fluff her dress for the photo and all of a sudden he’s, like, under it. And it was all sort of over before anyone could process it. He got hauled off and thrown in jail.” (The man has been identified as Ukrainian “journalist” Vitalii Sediuk, a serial red-carpet prankster who has previously tried to kiss Will Smith, stage-rushed Jennifer Lopez as she was giving Adele a Grammy, and dropped to his knees to hug Bradley Cooper’s legs and stick his face in his crotch.) In the wake of the incident, co-star Kit Harington — Jon Snow! — became immediately protective and turned to give an outraged glare to the photographers, while Cate Blanchett clasped Ferrera’s cheek in a sisterly manner and asked if she was all right. Adding to the bizarreness of the carpet was presence of the main dragon from the movie, Toothless, in live, walking mascot form. At the dinner afterward, Ferrera’s publicist checked Twitter, which was full news story after news story about the prank, and wondered if anyone would just talk about the dress. (Happy to oblige: It was Georges Hobeika couture, with a gorgeous cream tulle skirt and a beaded top with a plunging scalloped neckline, and Ferrera looked great in it.) Vulture spoke to Ferrera exclusively. So, how are you doing? 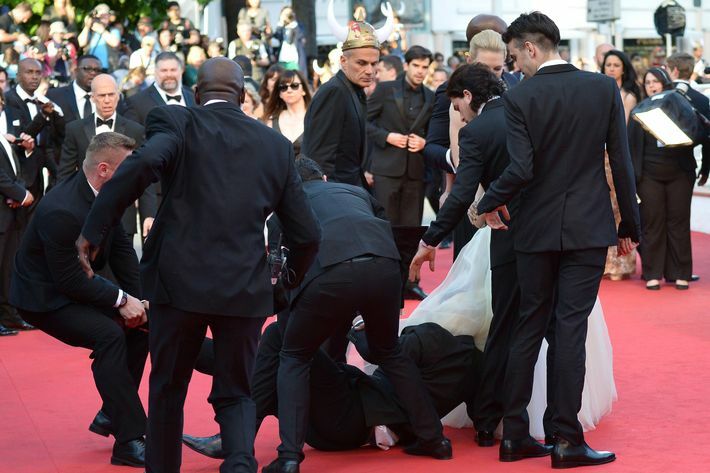 That was one of the weirdest things that’s ever happened to anyone on a Cannes red carpet. It seemed kind of violating. After the premiere, you and the rest of the voice cast received a generous standing ovation, but the audience stayed standing and you had to walk through the crowd as they applauded you each individually. What was that experience like? What’s kind of wonderful about being the voice in an animated film is you’re a small part of an enormous production. And in a way, you get to remain a little bit objective. So for me, I’m in awe of this film and I’m in awe of what the animators have done, what our writer-director did, our producer. And I was so moved that I felt like a fan, and I was on my feet, clapping. It’s hard to feel pride or take credit. I mean, I’m so happy to be a part of this beautiful film, but I also feel so lucky. And I had so little to do with it! I just recorded my voice. But I do think it’s so wonderful to be a part of this film, and to present it here at Cannes, you know … People tell you about Cannes and try to prepare you for what it is and the hype and the level of, you know, ceremony and ritual that it is, but there’s not very much that can prepare you for that very well. It’s my first time in Cannes. It’s been quite an experience! [Laughs.] If you’d asked me what my first experience at Cannes was going to be, I would not have imagined there would be dragons. I would not have imagined there would be, um, ankle biters on the carpet. And, I will say, I’ll never, ever forget the feeling of when we came out of the screening. Walking out hand in hand with your cast — Cate Blanchett to my left, by the way, holding my hand — it felt like a crazy weird dream. It was like, “I was at Cannes in my dream. I was on the red carpet and Cate Blanchett was next to me, and then some guy jumped under my dress!” But coming out and holding hands with the cast while this gorgeous music is blaring and hundreds of photographers are taking your picture — it’s the closest I could ever imagine coming to being crowned, like, Queen of England. That’s what it feels like. It feels like there’s some amazing coronation and whatever. Did you know Cate Blanchett before? I met Cate today for the first time! She’s the sweetest person. I tried not to geek out in her face. I admire her as an actor. I think she’s an incredibly well-spoken and smart and thoughtful woman. She always carries herself with such grace. No matter how silly the questions are — like today at the press conference, there were some silly questions, but she handled it with humor and grace. It was great to meet her. And Djimon Hounsou, who I also deeply admire as an actor. And Kit Harrington, who — I’m a huge Game of Thrones fan, so that was fun. I dressed up as Jon Snow to cover a big Game of Thrones event. Oh, really? I have a really funny Game of Thrones story. I got to record a lot with Jay [Baruchel] and with Kit because our characters interact a lot. And [once after] I recorded with Kit and he left, I said to the scene director, “That guy’s really good! Who is he?” And he’s like, “Have you heard of a show called Game of Thrones?” And I was like, “Oh, yeah. I’ve never seen it.” And since then I have become obsessed with Game of Thrones. And I thought to myself [shakes fists in air], I had my chance with Jon Snow! Not that way — I’m a married woman. But I was, like, I was in a room with him! You had the moment every woman on the planet wishes they could have had. Or just to geek out or fawn over him. And then of course when I finally saw him again, I thoroughly geeked out and said, “I was so blissfully ignorant of who you were when we were recording.” I just thought he was a really wonderful actor that no one had discovered yet. Was this the first time you’d seen the movie? Finished, yes. When I saw the rough cuts, the animation wasn’t complete, especially in the third act. I had a sense of what the story was, but the animation wasn’t done. And what really struck me was there were times where I forgot I was watching animated characters. There were scenes where I felt like the facial expressions from the performances felt so human. And I just forgot. I was just engrossed in the story and I was so moved. Jay [Baruchel] definitely caught me crying. I was sitting next to Jay and he turns to me and he’s like, “Are you crying?” “Yes, yes I am.” But it was wonderful. I loved this film. I cannot, cannot wait for the fans to see it. A lot of them. But I don’t want to give anything away! You said that you’d forgot that you were watching cartoon characters, but did you sometimes forget that your voice is in the movie? No! I think it’s so weird to hear my voice disembodied. To me, whenever I hear Astrid talking I’m like, “Ugggnnnnhhhh.” It’s like nails on a chalkboard.